Adding photos to your posts is very simple. Unfortunately simple cut and paste is not allowed, however, the process is very simple. 1 - Upload your photos to your favourite file storage provider, in this case, I am using Photobucket. 2 - Open your new topic, type what you need to and then open up photobucket in a seperate browser. 3 - Select which picture you want to insert. 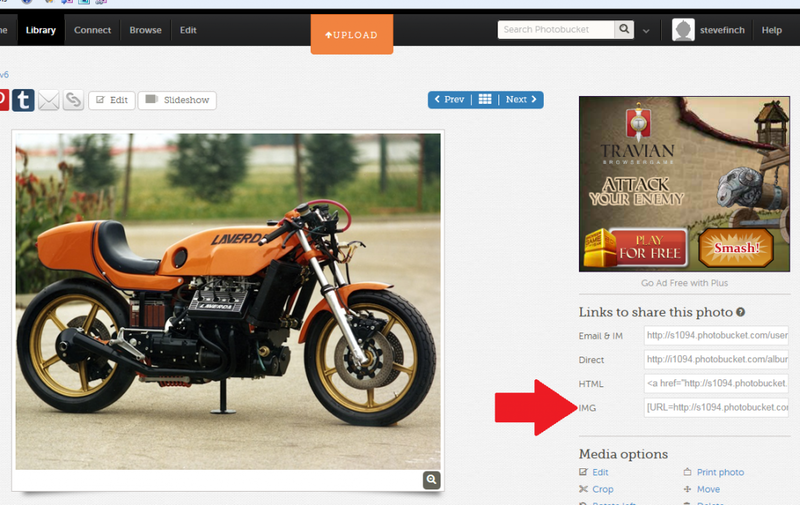 You're storage site will provide you with 4 options to Link your photo, Email & IM, HTML, Flash and IMG. 5 - Return to your topic, place the cursor where you want the photo to be, right click on your mouse and select paste. Once you have finished, you can use the preview button, next to the send button, to see what your post will look like. If you're happy, then hit send. If you have any issues, please give me a shout.